I savored my first sip of this tea-based fermented beverage in 2007. It is surprisingly similar to fermented apple cider and I was instantly hooked! Unfortunately, at $3.50 a bottle, it quickly became a rare indulgence. About a year later I made an attempt to brew my own. With not having anything to compare the growing culture to, I was convinced something was going terribly wrong! After 3 weeks into what looked like a biohazard nightmare, I scrapped the idea and stuck to buying bottles. This past summer, I decided to give it another try. Turns out I was doing everything correct and the scoby (Symbiotic Culture of Bacteria and Yeast) is supposed to look like a nasty mess while forming. If only YouTube had all those time-lapsed tutorials back then, maybe it would have restored my confidence in what I was doing! Kombucha, which has an undocumented history dating back hundreds of years, requires nothing more than a few easy-to-find ingredients and a bit of patience. I brew mine in gallon batches. Once it has reached maturity, it is transferred into a separate vessel and the process begins again. If you do not already have a mother culture, it will take approximately 4 weeks for one to develop depending on its growing environment. Each time you ferment a new batch of kombucha, a second scoby will grow, which is referred to as the baby. Eventually you will end up with several cultures resembling a stack of pancakes. You can compost them or give them away; I do both. (Freshly fermented black tea kombucha ready for refrigeration. The top layer of bubbles are from transferring from one vessel to another. 1 gallon filtered spring or distilled water, do not use tap water. 1 scoby or a bottle of commercially brewed kombucha tea if you are starting from scratch. 1 cup sugar – This acts as the food source for your growing colony of bacteria. 6 organic tea bags, either black, white, or green (or a combination). Never use flavored teas or teas with oil, such as earl grey, since they can harm the beneficial bacteria you are trying to grow! 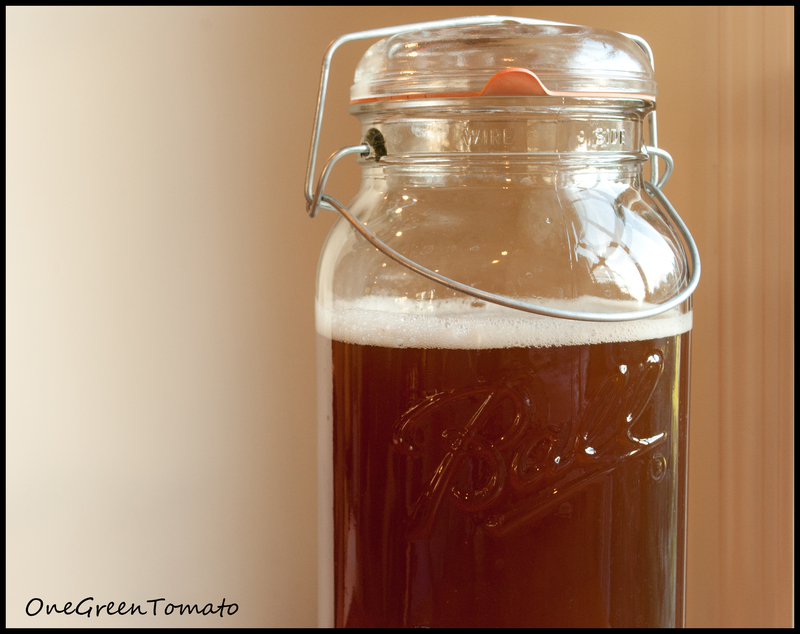 1 gallon glass jar – Never use plastic, the fermenting process can leach harmful chemicals into your tea! a piece of tightly woven cloth, such as muslin. Do not use cheese cloth or other open-weave fabrics, since dust, fruit flies, and other insects can make their way into your jar. Pour a bit of the filtered water into a stainless steel sauce pot, add the sugar and turn the heat to med-high. Once the sugar is completely dissolved and the water is about to boil remove from heat and add your tea bags. Steep tea in the sugar-water for 15 minutes. Carefully pour your tea into the glass jar and add the remaining bottled water. Be sure to not overfill the jar since you will need a bit of space for your culture to sit. Once the jar has cooled to room-temperature, add the scoby, or pour in the bottle of kombucha. Place the cloth over the opening of the jar and secure it with a rubber band. 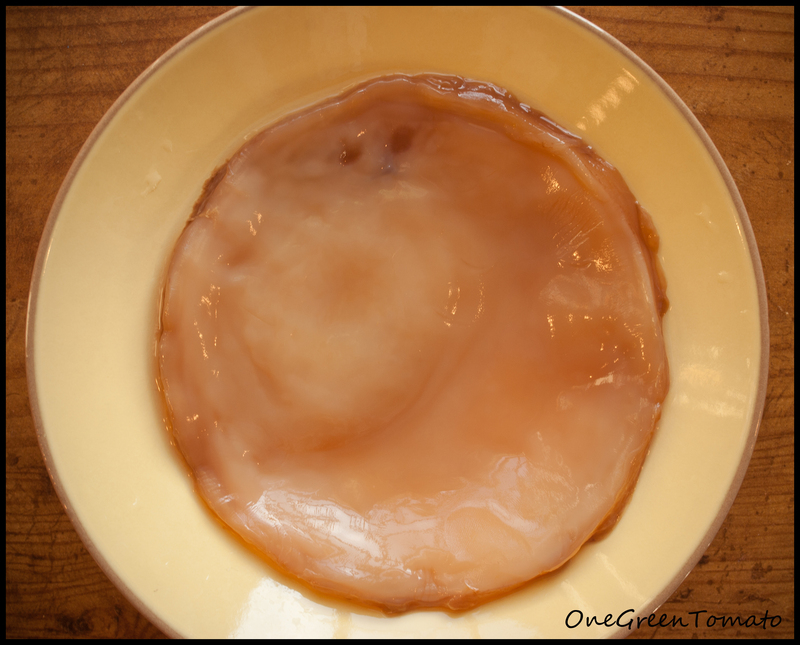 Growing a scoby: Over the course of about 4-5 weeks a mother will form. I warn you, it will look really really gross, which is completely normal. Do not disturb the jar, just leave it alone to do its thing. Once you have a fully formed scoby scoop out a cup of kombucha and with clean hands pull out the mother. Dump the kombucha that grew the mother, it will be too sour to drink, and begin brewing a fresh batch of tea. If you already have a scoby: Allow your tea to ferment for 10-14 days, remove the mother and reserve a cup of the kombucha tea for starting the next batch. It is at this time you can do a secondary fermentation to increase the carbonation or begin drinking your tea. If you are just going to drink it, strain and transfer the kombucha to another food-safe container and refrigerate. You don’t have to strain it, but another culture will begin to form if you don’t. Secondary Fermentation: To increase the CO2 in your kombucha, a secondary fermentation will need to take place. You will want to use a closed vessel, such as a growler, since carbon dioxide build up can cause bottles to explode! Allow the kombucha to sit out for an additional week. I have found that by the second opening of the growler the kombucha is flat once again… my solution to that problem! I’ve been fascinated by kombucha for a while now, but I don’t know where you can buy it. I’d like to try some (to see if I even like it) before venturing into kombucha-making. I don’t like tea at all, so I wonder if I’d like it. And I like apple cider, but I don’t particularly care for hard apple cider. My local food stores carry it in the refrigerated organic section; before that I had to purchase it from a local organic/natural market. It doesn’t taste like tea at all, more like a soured apple cider. Like Daedre, I wouldn’t know where to look? I just cannot get the scoby to grow 😦 I am deeply disappointed and cannot figure what I am doing wrong ,,,,any suggestions??? ,helppppppppp me,,,,,,!! It took a solid 3 weeks for mine to start forming, then another 2 weeks ’til I had something to use to ferment an actual batch of tea. Variables that can inhibit growth are using the wrong teas, the temperature being too cold, or using tap water. I have my first batch fermenting on my kitchen counter. Wish me luck! I can’t wait to try this. I’ve been wondering about making my own for a month or so now but it seemed so intimidating. I have so many things sprouting, fermenting, and brewing that one more thing just seemed like another book I’d have to read! Thanks so much for sharing! Very interesting Danielle, I have heard of this and never did know what it was, now I know how to make it. This is something I would be curious enough to try. Thank you for such a great post!! You’re very welcome, Mitchell! If you need a scoby and some starter let me know, I’ll send you some! I need a scoby! BTW how is that pronounced? Great! I have a batch just about done so I will send you the baby and some starter from that. It is pronounced with a long O sound (not like the cartoon dog). Just email me your address (growingmyfood(at)gmail(dot)com) I just ask that you pay the shipping which has been averaging around $4. Hi Danielle, do you have any kombucha babies left to share? I would love to try it and would be happy to pay shipping cost. I also would be happy to share some very happy multiplying water kefir grains if you’d care for any. No one else in my family will drink it and it appears to be very happy in our home. I am having trouble keeping up with it. The sourdough as well. I love kombucha! I used to have it all the time during wrestling season to help my metabolism. Do you have anymore live cultures that you could send me? Hello, I’m waiting on an address for the one I have available (I’ll have another one after the next fermentation cycle). If she doesn’t get back to me I’ll send it to you! I like my tea iced and my yoghurt with fruit on the bottom. Oh, and I prefer them separate. Almost everything in your post is right, apart from one crucial part: the tea bags. I find that this is the one step that nearly everybody is doing wrong. It is the most important part of Kombucha – its life essence – and determines the flavour of the resulting brew. And almost everyone is using inferior tea bags! Try good quality loose leaf tea (ideally not your standard off-the shelf supermarket variety, but one from an actual tea shop) and you will never go back to the old tea bags. That’s a promise. Try it, it’s a very small investment to make. It’s funny you should mention that since I typically drink and prefer loose leaf tea! Unfortunately, all the ones I have currently are flavored with various herbs and oils. I’ll have to pick up some organic black tea the next time I’m at the tea shop! this is something that almost everybody does wrong, so don’t fret. But it’s funny how most people try to save a few cents for a product that requires a considerable amount of time, thought and care. You CAN use scented teas (the ones scented with flowers, rather than oils), and get good results, but I’d recommend experimenting with different pure teas. From experience, black teas are possibly the hardest to get perfect, green oolongs or green teas are more forgiving in your timing for bottling. Can you use Yerba Mate? I’ve never read about or seen kombucha made with yerba mate, so I’m assuming no, but I could be wrong. No, my understanding is that you need tea (i.e. camellia sinensis) to feed kombucha. While Yerba Mate is sold as “tea”, it isn’t a real tea. I know at one time Whole Foods carried bottled kombucha, but I’m not sure if they still do. Check with your local health food stores that specialize in organic and vegan items, they should have it! Happy fermenting! Hi ! This is great, thank you ! One question though : do we have to pour the WHOLE bottle of kombucha or just a cup ? Hi, If you are growing a SCOBY from scratch, then you need to pour in the entire bottle. If you already have a SCOBY then you only need a cup from the previous batch to use as starter. I love kombucha! I got a mother from a friend of mine, and made some great tasting brew…unfortunately, I discovered that it contained penicillin. I am VERY allergic to penicillin, and it took me about a week of drinking my home brew to figure out that my numb fingers, prickling tongue, and then drop in blood pressure were due to my brew. Just a warning to folks out there – because the mother (scoby) is a spore, sometimes penicillin shows up in home brewed kombucha. It was with a heavy heart that I gave my mother away. The Kombucha sold in stores is treated (somehow) to get rid of the penicillin. I love your blog – just found it! Go for the chickens – we live in downtown Fort Worth TX and raise them in our backyard!! Thanks for your kind words about my blog! What a bummer about your penicillin experience! 😦 The chickens are definitely on my To Do list!! Thanks so much for reading! Hi Jeanne! I live near downtown fort worth and I’m looking for a scoby so I don’t have to start from scratch. I know your comment is three years old but do you still live in the area or do you know where I could find one around here? thank you! Do you have any scoby babies I could buy? I just thinned out my mother and composted a bunch the other day. Sorry! Thank you for posting this how-to on starting your own Kombucha.I just heard of this for the first time the other day, and wondered where I could get a scoby. I’m going to try this, wish me luck. I am starting this adventure and am very nervous about killing my new Scoby and ruining this thing. I just received a Scoby “baby” that has two layers already growing on it, would this then actually be a “mother”? I have the liquid it was grown in as well. Should I leave my Scoby layers and all alone and brew my tea or do I need to separate these layers? If I separate them how do I do this without damaging the other layers? Which layer do I then use to begin my first brewing cycle? How do I store the other layers so that they do not go bad? I am also very confused about “Straining,” what do you mean by this? How long does the tea after fermenting for the 10-14 days last so that you can drink it and at what point do you begin the whole process again. The person who gave me her “baby” gave me details on what to do but I still feel very confused and after reading your blog there were some differences in directions. Yours were better and I understand them a little more, lol. There are differences in directions, since there are slight variations in how people brew their kombucha. As for you to get started, use everything you received (e.g. both scoby layers plus the liquid) to make your new brew. Having multiple scobys doesn’t hurt your brew, but it diminishes the space that you have in your brewing vessel – so you don’t want the scoby stack to get too thick. When it comes to peeling a scoby off, best start with removing the bottom scoby. Older scobys are a bit more powerful in turning over your tea, but younger scobys give you a slightly ‘cleaner’ taste. Straining is required to remove the strands of yeast that float in your finished kombucha after you’ve taken the scoby out (trust me, it’ll all become clear when you bottle your first brew). After bottling, the secondary fermentation makes your kombucha fizzy. How long it takes varies, depending on temperature and the tea you’ve used (darker teas fizz up faster than lighter teas). 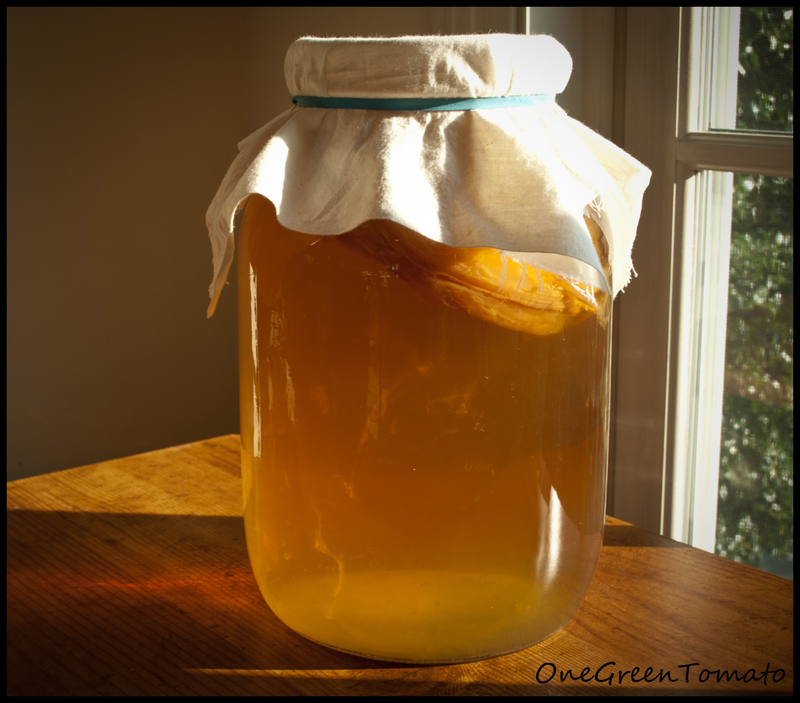 Finally, to store extra scobys, just put them in a jar and feed them with sweetened tea every week or so – but you don’t need as much tea as you will for making the fermented tea. Thanks, Jo! I could not have answered Amy’s question better myself! Thank you so much for all the answers. This really does make things a little less intimidating. When I strain, does this mean I am pouring the tea through a colander or some kind of cloth? @Amy: The straining part happens when you pour the finished kombucha through a funnel into your bottles. A colander is too big for that. I’d use a small stainless steel strainer, sitting in the funnel. Alternatively, a cheesecloth lining the funnel will do the same thing – but it’s much harder to clean since the strands of yeast are pretty slimy. Hi Amy! Sorry I wasn’t able to get to your question yesterday, but Jo responded with a spot-on answer! I produce kombucha on a small commercial scale now, but I remember the days of homebrewing well – and all the questions, experiments (failed and successful) and mayhem. BTW, I love reading your blog. Beautiful layout and great content! Hi Danielle, Not a problem. I am glad my husband found your blog and I look forward to reading more of it. I am sure I will be back with plenty of more questions. Found a Scoby! I did a second ferment on mine with grape juice. I used the Scoby from that to make fermented lemonade. Oooh blueberries, How do I make this happen? Just drop a handful of berries into whatever vessel you are using for the second fermentation and a few days later you have an amazing bottle of blueberry kombucha! I cut a few berries in half to really infuse flavor into the brew. Awesome…Danielle! This part I can certainly do without messing anything up, lol. How do you do this with the grape juice and then lemonade? I really dislike apple cider so me even trying this Kombucha thing is amazing, but if I can somehow get a different flavor than I may be able to stick with it.